This time’s visit to America was started off by me singing lines from “Seventeen” to the customs officer at the entry point to New York. “So, what do you intend to do in New York?” he asked me. Imagine me: standing in JFK, a row of tired and grumpy people standing behind me, and there I was, bursting into song. The guy behind the counter shook his head (he didn’t recognize the song!). Still, he laughed (he’d been quite solemn), wished me a wonderful visit, and stamped my entry ticket. As I walked away, I heard the lady who had been standing behind me give the officer a loud and cheerful greeting. I hope the officer was smiling still. One of the things Janis Ian taught us during the week in New York, was that fear is a construct. Except for atavistic fear, every other kind of fear is something that we’ve learned and what can be learned can be unlearned. When I was standing in that line, I thought of my first visit to the US when I could hardly say a word to the officer behind the counter and ended up getting detained and interrogated for about an hour. I felt the familiar tickle of stress and the teary urge to break down. The week with Janis Ian was marked with so many instances where I had to face up to the constructed fears that stood in the way of me doing things. Coming out of JFK, I felt a huge burst of confidence. I was in New York, standing on the edge of change. To the artist, change is a constant. If we’re lucky, change means growth and development–a deepening of the work, a deepening in insight, growth in perception and understanding. Maturity not just in the work but in ourselves as human beings. Growth as an actor and growth as a human being are synonymous. I would dare to exchange actor with artist and say: Growth as an artist and growth as a human being are synonymous. If we remain stagnant, if there is no growth, what does this say about our art? What does this say about us? What does this say about our practice? Regardless of what field of discipline we occupy, our exercise of our art, our commitment to our work is what differentiates us and binds us together in a global community. There’s so much to unpack about that question. So much that can be said about ancestors, about the litany of names that have brought us here and continue to carry us through. We are one in a chain and I am grateful for the bones I’m standing on. 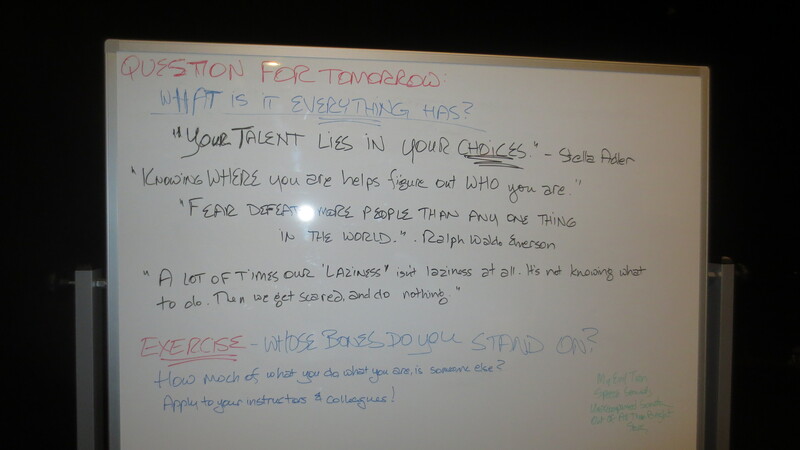 Check out the board below and think on these things.